Most of my favorite receipes are really simple and no books are needed to make them. We can go weeks eating fabulous meals and only take a look at a cookbook when making pizza dough. You do need some measurements for that. In my opinion, no recipe in any of Yotam Ottolenghi’s books is simple. Every time you start making something you wonder if the end result will be anything like in the picture and make a quick plan B in your head. Oh good, we do have pecorino romano in the fridge, so if this is going to be a disaster, we will have cacio e pepe for dinner… Or something like that. And yet I love the books. You browse them and get inspired then you try something and it works out. It is good. It is so good you cannot get enough of the taste and that is what you repeat over and over again while eating. I cannot believe how good this is... Suddenly you are happy the recipe was not super simple because you would never want to start taking this dish for granted, start feeling like you could make it any day, without preparation and concentration. This is a dish you plan on making. It is like taking a trip. Making an investment. The book suggests you serve the rice with roasted chicken. Do what you like. I have never been able to find barberries, the sweet and sour Iranian berries used in many of Yotam Ottolenghi’s recipes, in my grocery store. Apparently they are available online. For a substitute, I have used dried currants or lingonberries. Melt the butter in a medium saucepan and stir in the rice, making sure the grains are well coated in butter. Add the boiling water, 1 teaspoon of salt and some white pepper. Mix well, cover with a tightly fitting lid and leave to cook on a very low heat for 15 minutes. Don’t be tempted to uncover the pan; you’ll need to allow the rice to steam properly. 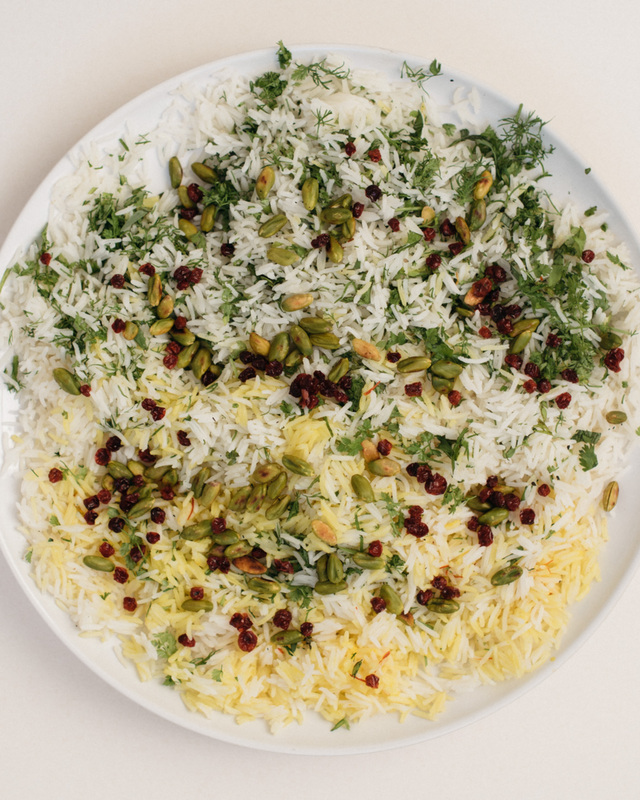 Remove the rice pan from the heat – all the water will have been absorbed by the rice – and pour the saffron water over one side of the rice’s surface, covering about a quarter of the surface and leaving the majority of it white. Cover the pan immediately with a tea towel and re-seal tightly with the lid. Set aside for 5-10 minutes. Use a large spoon to remove the white part of the rice into a large mixing bowl and fluff it up with a fork. Drain the barberries and stir them in, followed by the herbs and most of the pistachios, leaving a few to garnish. Mix well. Fluff up the saffron rice with a fork and gently fold it into the white rice. Don’t over-mix – you don’t want the white grains to be stained by the yellow. Taste and adjust the seasoning. Transfer the rice to a shallow serving bowl and scatter the remaining pistachios on top. Serve warm or at room temperature.